This post comes a little late in the day, but in the same time just in time for dinner! And I swear that I did not plan on this. But if it’s time for dinner, then you’re in luck. 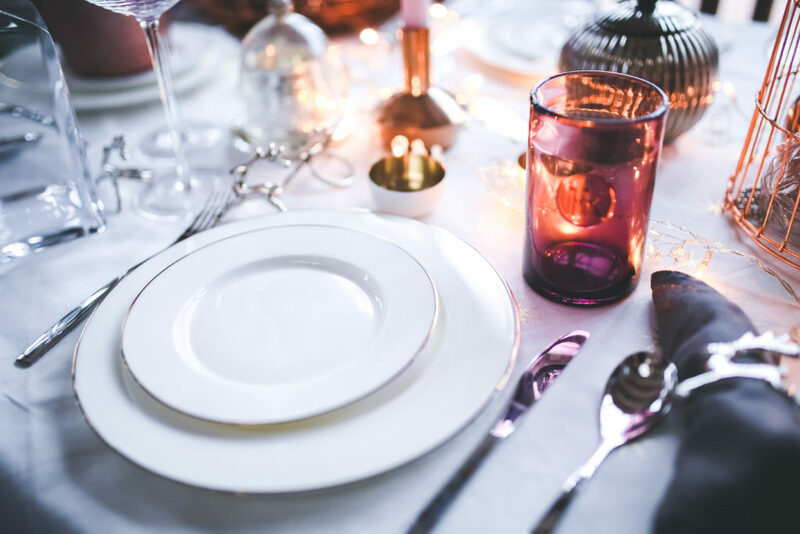 I come today with a few suggestions for the dinner table and how to make it more fun, exciting and beautiful. 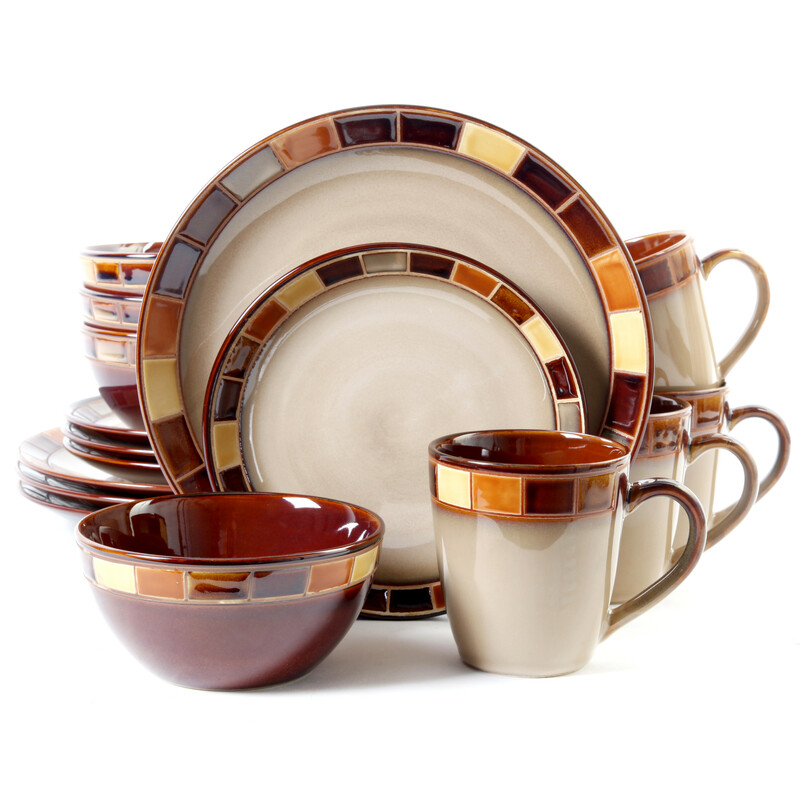 I have selected a few, or more, sets of dinnerware to share with you. This time, all the products come from a single website, which I recommend you to visit for any home needs. The website is called Wayfair and it has locations in the United States, United Kingdom, Canada and Germany. For this article I got inspired from the United States website but I am pretty sure that some of the products, if not all, can be found on the other websites as well. I promise in the future to include products from locations in Europe as well. 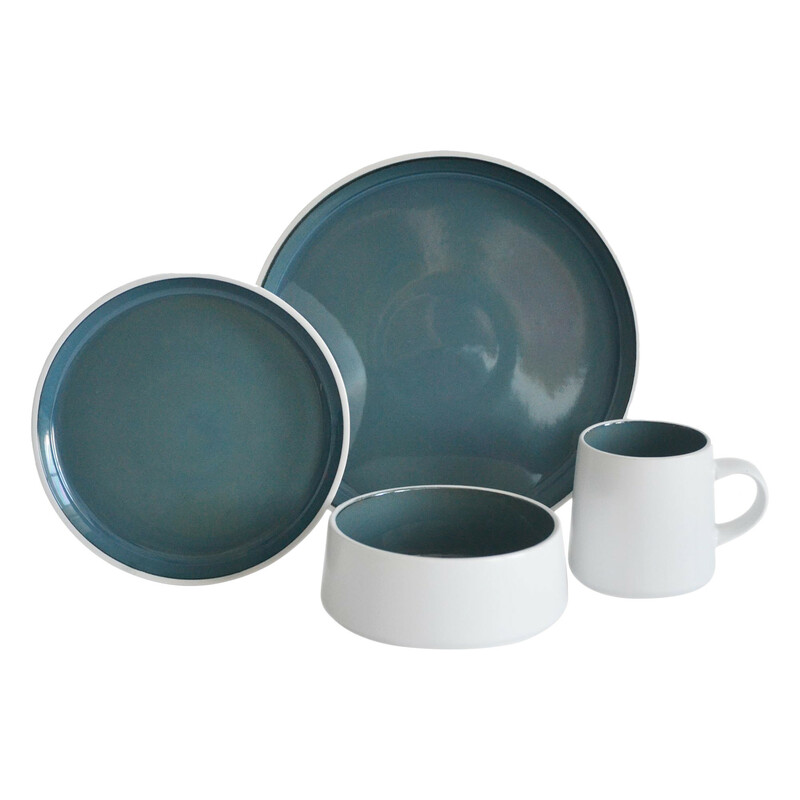 The first product is a beautiful and simple set for 4 people brought to you by Sango. 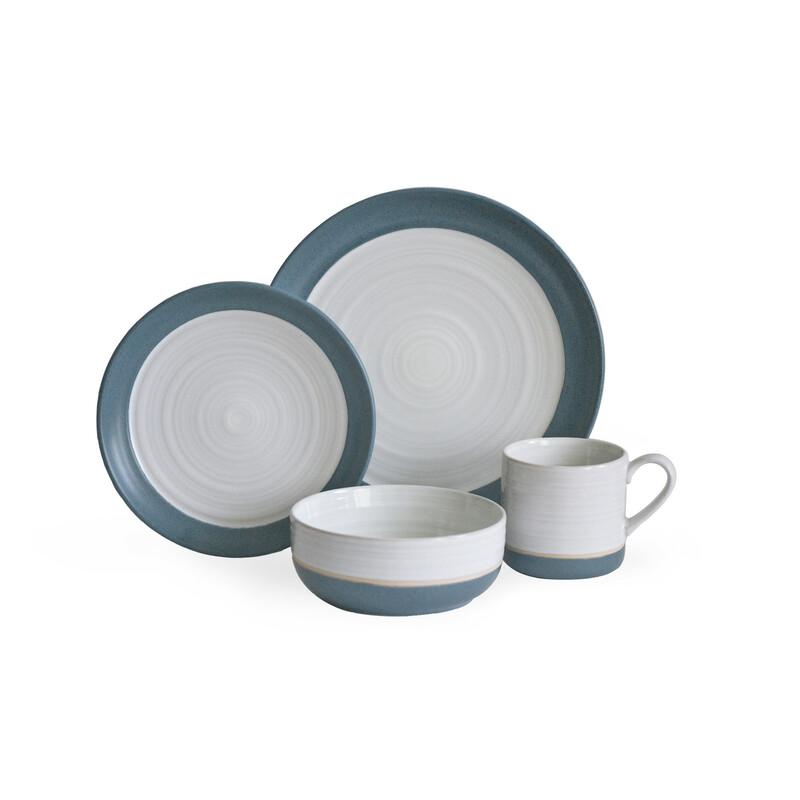 With a delicate and calm color, this set seems the perfect fit for a rustic kitchen and it goes with both modern and more classic designs. 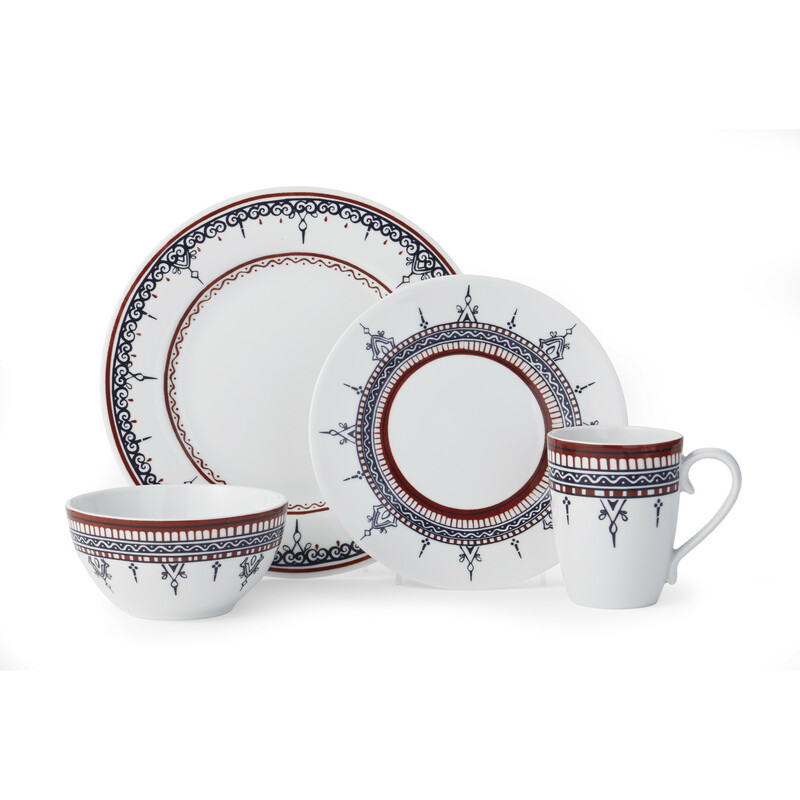 In order to proper introduce this next set, I have to mention that I am a huge fan of dinnerware in two colors, one on the outside and another on the inside. And this guilty pleasure of mine you will notice not only in this set but also in a few others following. But returning to the one at hand, this set for 4 I would describe as fun and bold. This is the way to introduce a little color into your kitchen while still keeping the clean and neat appearances. 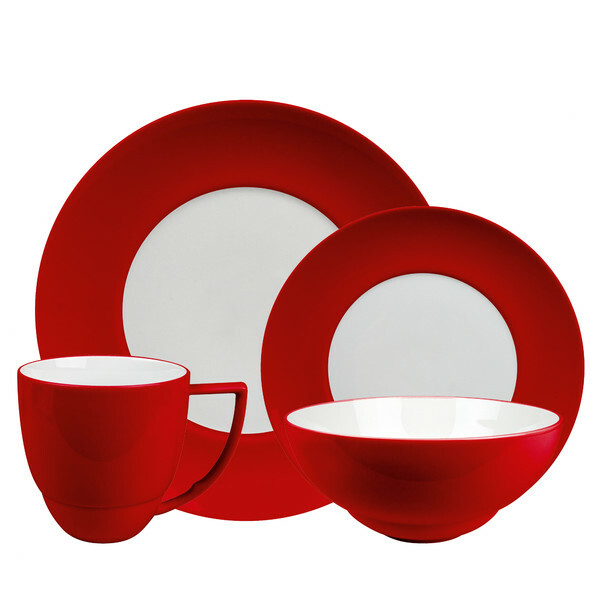 This set is also available in red, orange and simple white. Returning to mother earth, I bring you another 4 person set in gorgeous earth tones and with a beautiful accent around the edges that just puts these pieces out there. This set also repeats the 2 colors idea that I love and the combination of different earth tones in a mosaic form around the edges just took my heart. I hope this set will find its way into your hearts and your homes. 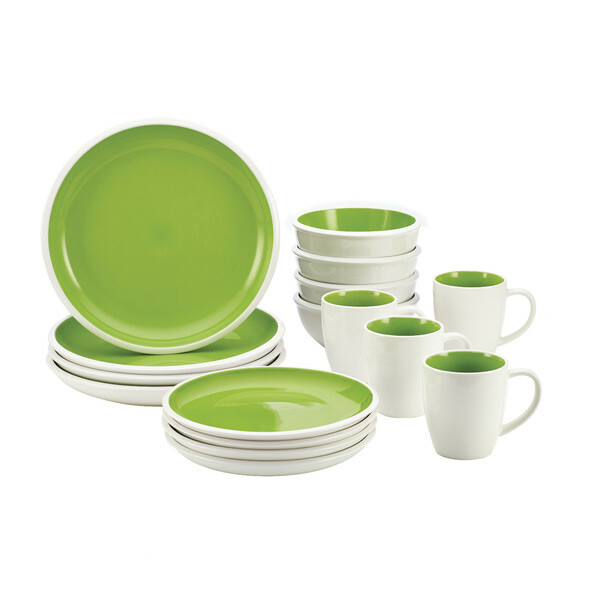 From mother earth, we go right into the sea and loose ourselves into the color of this next set of dinnerware. Although it comes in 3 colors which are blue, grey, and white, I could not move past the blue version and right it went onto my wishlist. White on the outside, blue on the inside and with a more unusual shape for each of the 16 pieces that it holds, this sets makes my top 3 to have, use and love. Speaking of sea and water, have you ever thrown a stone in the water and notices its gorgeous ripples that form at the surface? 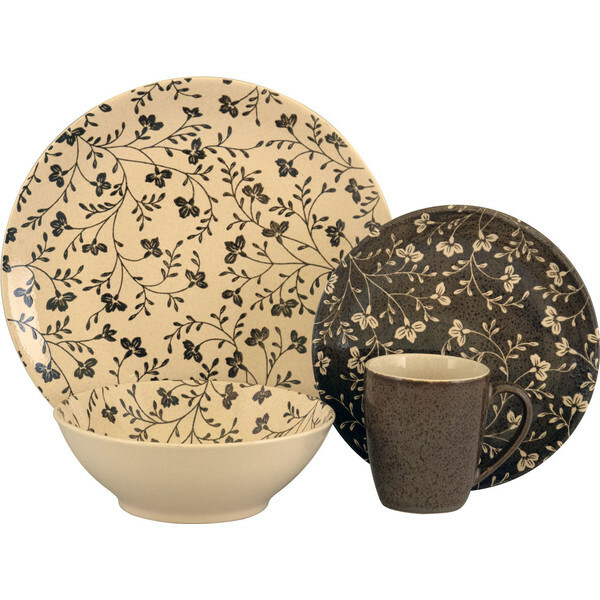 Well, I found a dinnerware set that imitates that with its design. With the same color scheme, only reversed a little, white in the center and blue edges, these rippling plates will bring the freshness and tranquility of water right at you dinner table. This next set came as a surprise for me. And I know what you’re thinking, how can it be a surprise when I was looking for dinnerware sets? Well, let me explain. The surprise was that I don’t usually like patterns on plates, especially intricate geometric patterns or something of the sort. But I was really intrigued by this set and after observing it for a few minutes I decided that I really enjoyed it and would actually consider owning it. The pattern is intricate yet simple and it is only limited to the outer edges of each piece, making everything fit together beautifully. Taking again a look at my top three choices, we discover this simply gorgeous set of dinnerware, which is colorful, rustic, and simply adorable. 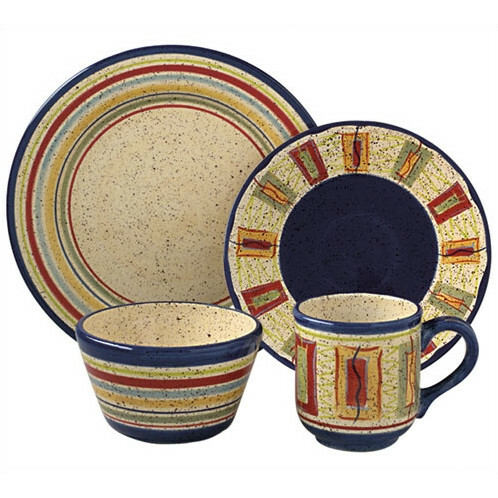 The design of this set is divided in two parts, the dinner plate and bowls presenting a lovely colored stripped pattern on the edges and exterior and the salad plate and mugs presenting an interesting geometric pattern on the outer rim and exterior with matching colors. The entire set looks just gorgeous from the inside out and it would be a gorgeous addition to a rustic and colorful kitchen. Speaking of two by two matching sets, my next choice is a more delicate and refined pattern that would fit into a classic or rustic kitchen the same and it would bring to both a bit of class charm, and warmth. Even though I don’t usually go for flower patterns, this one got to me and made me think twice about my preferences. If all of these delicate and subtle designs have bored you by now, don’t leave! I have plenty up my sleeve and what’s coming next is a daring one. If you like bold colors and are not afraid to show that, then this Uno set is the right one for you. It comes in red, blue, yellow, and green and there is nothing subtle about any one of these colors. Standing out with big and bold lines and eye catching colors, for my favorite I chose the red option, but I would not say no to any of the other. Last but not least, comes a very special addition to this list. I know that the winter holidays have just passed but I didn’t start my blog until February, so you will have to excuse me if I am a little late with my timing. I promise that from now on, my holiday suggestions will come long before the actual holidays. 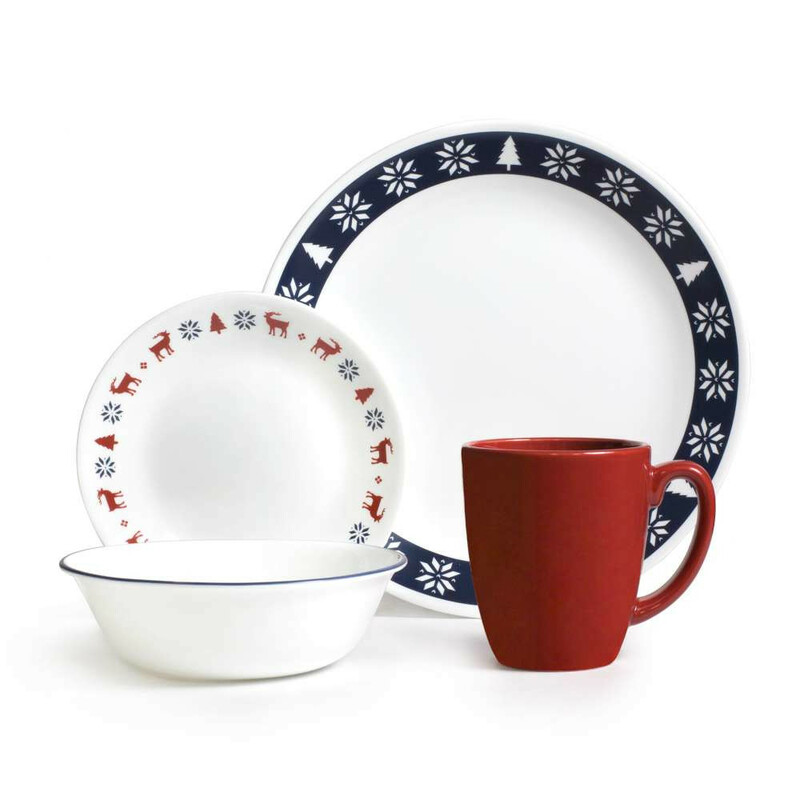 And getting back to dinner, I have found the perfect and most charming set of dinnerware that would be perfect for Christmas, be it breakfast, lunch, or dinner. I know that this may not be the most adequate choice, due to its Christmas themed pattern, but as soon as you see it I am sure you will fall in love and want to use it every day of the year. And now that it is a little (more) over dinner time, I hope you enjoyed it and that my suggestions will help your future meals be filled with colors, happiness, and joy.